This was a new experience for both Richard and I. The Blaufrankisch red grape (syn. Limberger, Kekfrankos, Frankovka, Franconia) thrives in the eastern part of Austria – the Burgenland – and, in particular, the Mittelburgenland DAC, where 75% of the wine production is red. We have both been underwhelmed by red wines made in regions dominated by good whites (notably Alsace) but we are always prepared to be astounded – and thus, confounded. 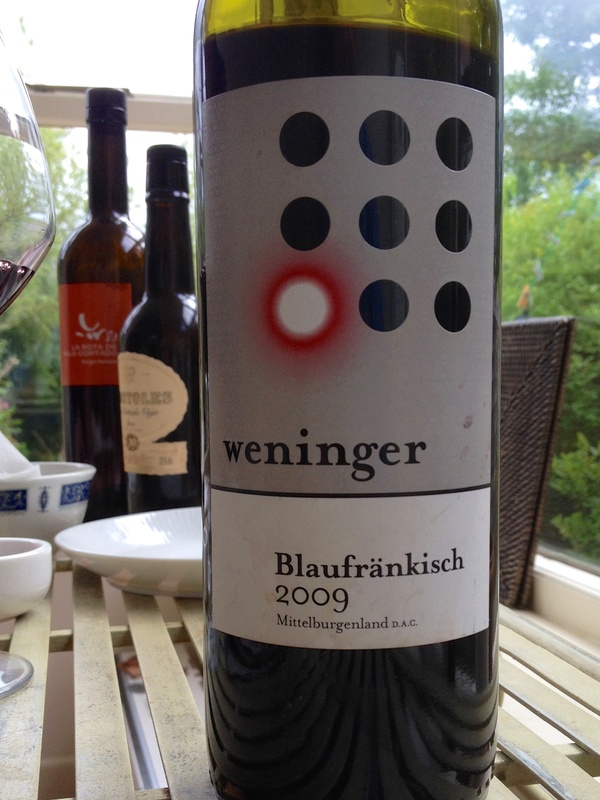 The wine was a 2009 Blaufrankisch made by Weninger (12.5% ABV) and supplied by Vin Neuf wine merchants in Stratford at circa £9. We drank it at a slightly cool room temperature. The colour was garnet red with very slight purple tones, not particularly clear and showing some windows. It had a refreshing acidity on the nose which was also vegetal with a hint of smokiness. So far so good. The palate was that of a dry wine, full-flavoured with rich, cherry-like tartness but rather short and lacking in real finesse. It reminded me of northern Italian reds in its weight and acidity, not particularly distinguished but great with tomato-based dishes. 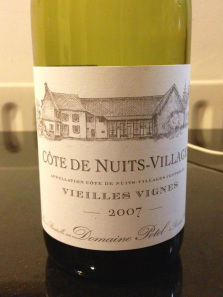 Verdict – a well-made wine and good value for the price but, as Richard summarised, it was like ‘village Pinot’. I am going to chill it Sunday night and will add to the report. “If I had a thousand sons, the first humane principle I would teach them should be to forswear thin potations and to addict themselves to sack.” (Henry IV, Part One). Thus, Falstaff did opine his view on “good sherris-sack” – and we were inclined to agree – after the tasting of these two Palo Cortados. It was great fun doing a comparative tasting of PCs – an unusual sherry by virtue that it has ‘gone wrong’ and stopped developing as a fino i.e. under a protective flor of yeast and has moved towards an oloroso, maturing via oxidisation. (That’s the technical bit). 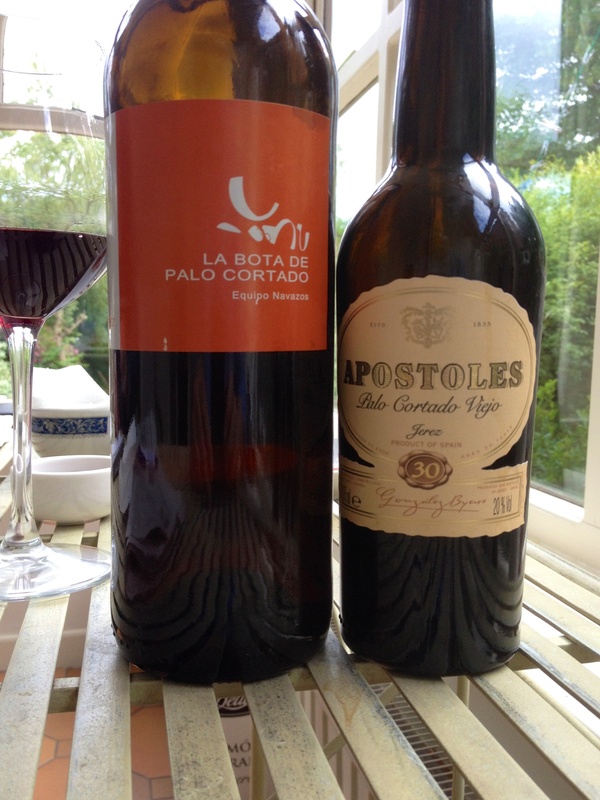 We tasted and compared the La Bota di Palo Cortado 21 (20.5% ABV) and the Gonzalez Byass Apostoles Muy Viejo 30 (20% ABV), hereafter known as LB and GBA. The colours were old gold, deep honey for the LB whilst the GBA was deep tan with red tones. Both were clear but the GBA had more pronounced windows. The nose of both wines suggested some acidity but the LB was more forward than the more subtle GBA. The former suggested salty caramel whilst, as the GBA developed in the glass it became more raisiny and had a richer aroma. The palates of both were wonderful but quite different. The LB was very slightly off-dry with great length and refreshing acidity whilst GBA was more tangy and weightier in the mouth, yet still off-dry and not cloying, despite its appearance. We both thought the LB a more complex mouthful; Richard stating it was the driest Palo Cortado he’d ever drunk. This dryness might be the reason for the slightly higher alcohol level of LB. The wines went beautifully with olives and smoked air-dried ham. Both were excellent drinks. After this, we can empathise with Falstaff’s views. [Richard: not sure where the LB came from or the price. Around £30 I would guess, possibly from Gauntleys. However Equipo Navazos wines have really shot up in price (the LB is now nearly £50 here) so I can’t see that I’ll buy anymore. Not that they are easy to find. The GBA was a birthday present from Geoff. When should you drink a wine? This wine was purchased from the Wine Society (£17) in about 2011. 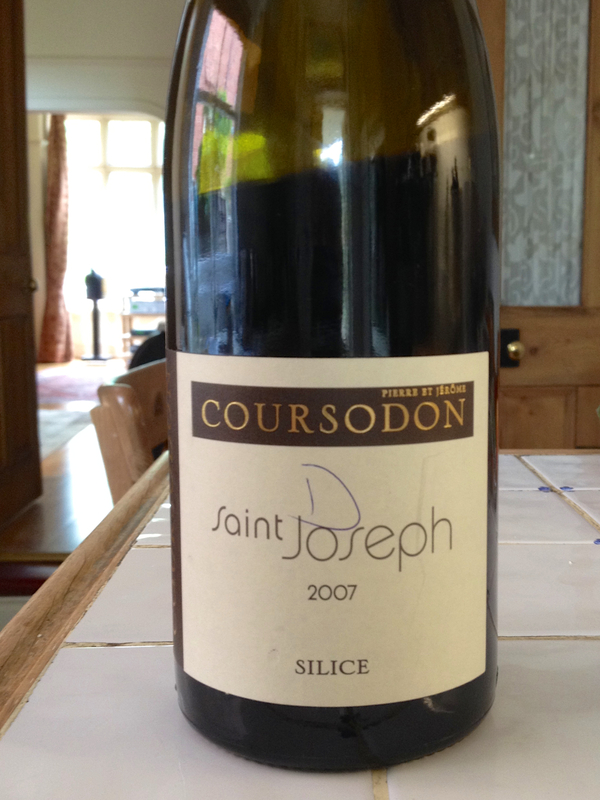 As they put it ‘this is Coursodon’s cuvée of younger vines and for more immediate drinking. His 2007 has an abundance of easy charm in a lovely fruity style… to 2013’. This is a typically very conservative drinking window as the wine is indeed fruity and spicy but with no traditional signs of age, such as a brown edge in the glass or fading on day two. I found some reviews on Cellartracker – my preferred source of such information, which said it was ready but not past it, as it proved. A first on TtC – a retaste. Readers with good memories might recall a post on this wine in January 2013. I didn’t think much of it then. However Geoff (he didn’t recall the previous post either) and I tasted another bottle last night and it wasn’t bad at all. Pleasant, rather smokey nose, some depth and power on the palate. Still not enough pinot for my taste but very drinkable. Between then and now I’d tried another bottle which was as last night, so perhaps there is some bottle variation. This commune, in the Medoc area of Bordeaux, has a reputation for value for money, containing “many minor growths of rustic charm” (Stevenson). 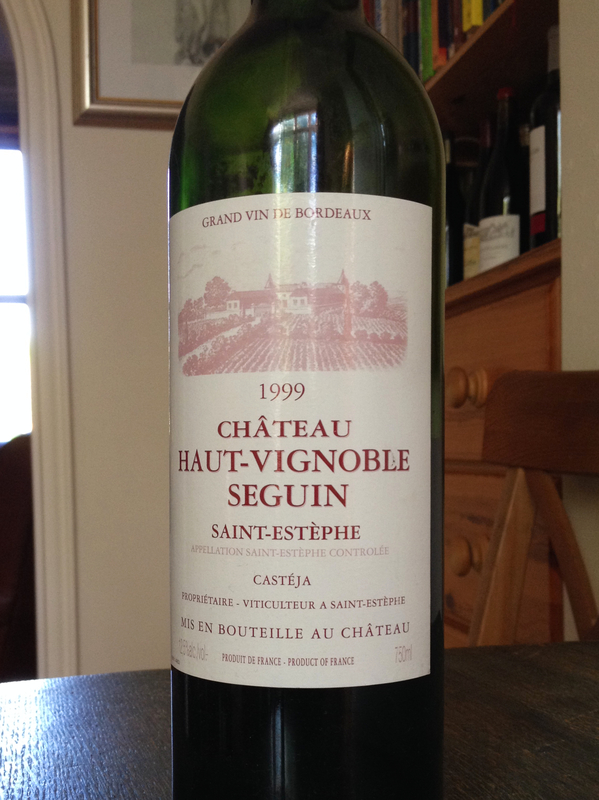 This Chateau Haut-Vignoble Seguin 1999 (£12.99 from Majestic Wines) fitted that description admirably. I tried it 24 hours following the initial un-corking (I had used a vacuum pump on it to preserve any freshness) but it stood up very well. The blend contains about 70% Cabernet Sauvignon. The colour was deep red but with a slight brown rim, clear and with some viscosity. The nose wasn’t particularly fruit-driven but rustic and rich rather than elegant. The palate was dry with some refreshing acidity, of medium length with pronounced flavours. The tannins had developed to a gentle smoothness and this was kept refreshing with some acidity that was in balance. It was exactly as Stevenson described – but none the worse for that. This was the second of two wines tasted (after the white Bordeaux) in the same evening and, whilst our opinion of the first was lukewarm, this was excellent. 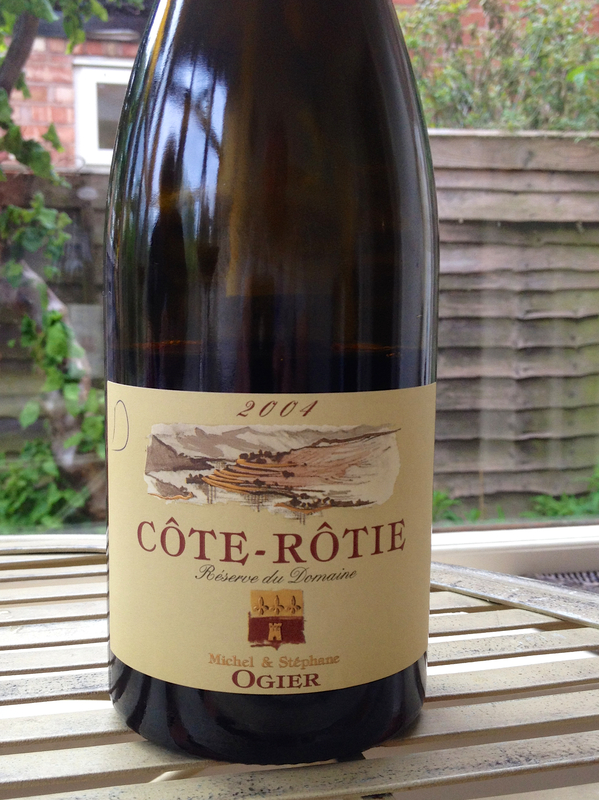 It was Ogier’s Cote Rotie 2004. It was described as an ‘assemblage’, although 100% Syrah (no Viognier, though it is permitted), the base wines can be drawn from different plots in the area. The colour was very deep red right to the rim – almost black – and opaque. There were some windows indicating medium viscosity. It had one of those bouquets that could be enjoyed time and time again, each sniff revealed another layer of aromas. Our comments ranged from initially menthol to spiciness and then smoke, followed by cooking smoked bacon! There was even some delicate floral violet notes in there. The nose was developed Syrah at its best – complex and delightful. The palate was silky smooth and rich with still plenty of life in it. The acidity kept it refreshing and not at all big, brash and sweet as some New World Syrahs can be. No, this was in the classic European style of delicate, finer Syrahs that stayed dry right through its long finish.The acidity kept ensured we kept wanting more. Accompanying food would need to carry some flavour but not so much as to eclipse its delicacy – I would not use it with a ‘barbie’ but venison, ox cheeks and fillet steaks would be ideal. White Bordeaux – and a sorry. 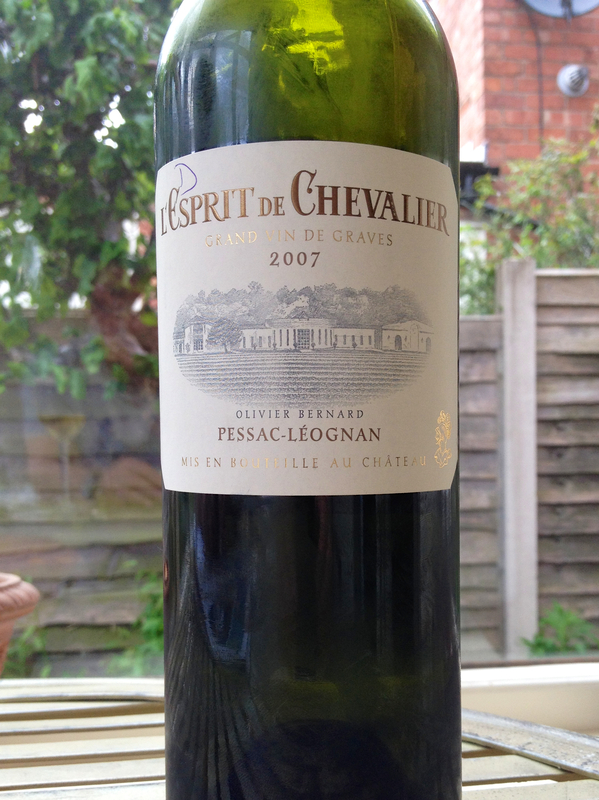 Anyway, this is L’Esprit de Chevalier 2007, a Pessac-Leognan – the area that surrounds Bordeaux itself, on the left bank of the Garonne. Traditionally, white Bordeaux have used a blend of grapes – Sauvignon, Semilllon and, to a lesser extent, Muscadelle. The bright citrus of the dominant Sauvignon is balanced by the luscious lanolin texture of Semillon – it’s a particularly potent blend – and one I like. This clear and bright wine had a deep lemon colour, suggesting age, but not without a green tinge which also hinted at youth and acidity. The nose was subtle, not particularly expressive, deep but again with some citrus notes. On the palate, it was rich with a good balance of acidity and of medium depth – obviously a well-made wine. We both thought it was a bit ‘ordinary’, not particularly expressive but rather lean-boned, lacking in any ‘give’. It would match delicate fish flavours and it did need food. We thought it might get better if opened a while but that thought was more in hope than expectation. (I had an 08 Clos Floridene, a white Graves, the following night and this was much richer, a lovely balance of the two grapes’ styles. It rather showed how L’Esprit could have been). Comments Off on White Bordeaux – and a sorry.